A support level is a level at which the price an instrument will fall too before bouncing off it and rising. The idea/Psychology behind a support level is it’s a level where someone else has sold the instrument thinking the fall will continue. The price has risen from this level so the person has been suffering a loss. Since most people after being at a loss are happy to break even they will buy out of their position at the same level thus causing the price to rise again further confirming the support level(Support zone). I believe there is no such thing as a single support level more a support zone. If you can identify a support level what you normally find is the level is rarely that same price twice. More it is a support zone where all the support prices are similar and usually within a range. Support zones are violated when the price breaks below the lowest support zone price. At some point a support zone will be violated if the price continues to test this price level. The best way to think of this is if you jump up and down on an old floor sooner or later the floor will collapse and you will drop down to the next level where the floor supports you. 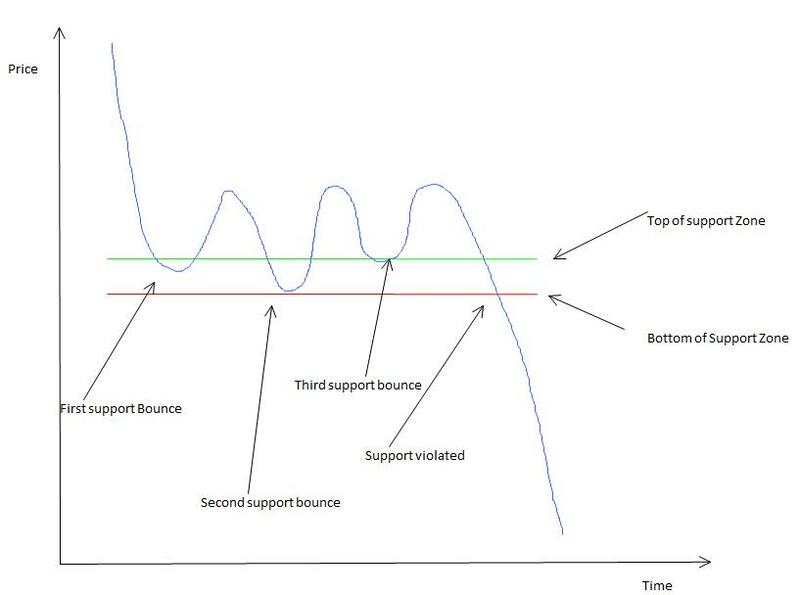 The image below (Support Zones) demonstrates a price bouncing of a support zone before the support zone is violated. I personally believe that support an resistance levels are something that must be understood by anyone attempting to trade successfully.